Second race of the weekend – Ironman Lake Placid. 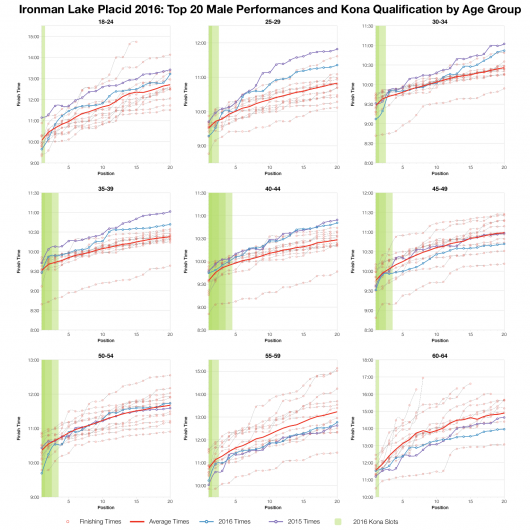 The biggest of the events with over 3,000 entries (fewer starters mind), but still the standard 40 Kona slots on offer to the fastest age groupers. It looks to have been a slow year based on the results with times in all three disciplines trailing behind the course averages. A quick glance at the distributions above is enough to show how this year’s race trended slower than the aggregated course results. 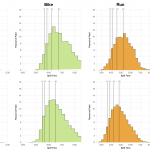 It’s worth noting how in both bike and run peak split times are consistent with past results, but there’s much more weight in the rear half of each histogram. So although times appear slower across the field there’s a particularly heavy middle to back of pack really pulling the medians down. Entry numbers are the highest at this year’s event and so too are the combined DNS/DNF statistics. In all three disciplines the DNF/DNS rate runs at the high end for this event. I can’t say what pushed the DNF/DNS rate up, the numbers are comparable with last year though. It may be conditions were tough at Lake Placid yesterday, but potentially we may also see greater numbers of DNF from the extra weight towards the back of pack. 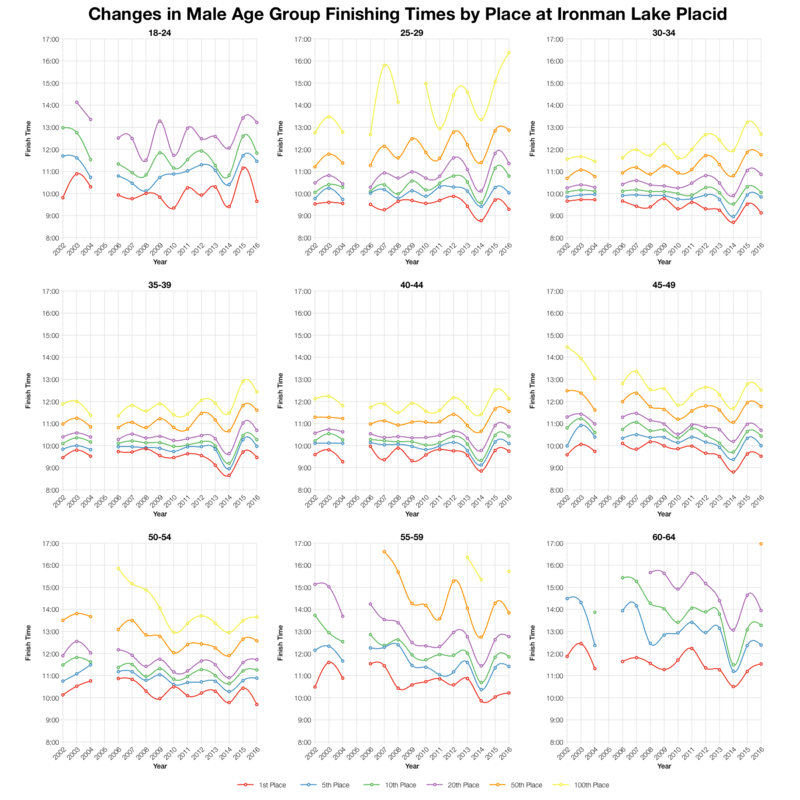 As we’d expect after the distributions, median splits for age groups largely trend slower than before. It’s true across all 3 disciplines and most age groups. 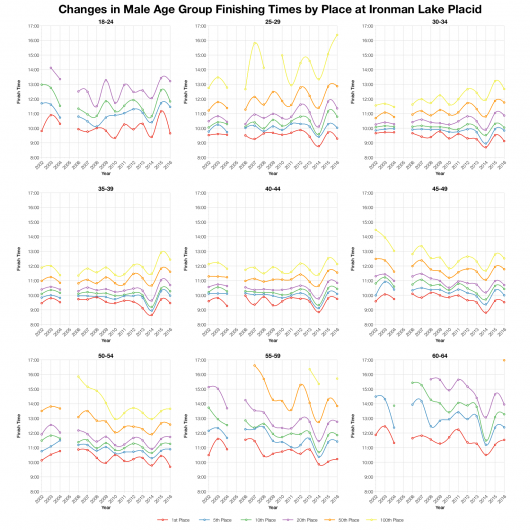 The majority of athletes at Lake Placid are, unsurprisingly, from North America. It’s not often we see India among the 10 most numerous nationalities at an Ironman. Tracking the finishing times for top 100 finishers at Lake Placid actually places this year’s race on a par with previous events. This may reflect the size of the field – some age groups will number over 400 athletes putting 100th place in top to middle of pack. These particular charts may miss the influence of that bulk of middle to back of pack athletes seen in the distribution charts. 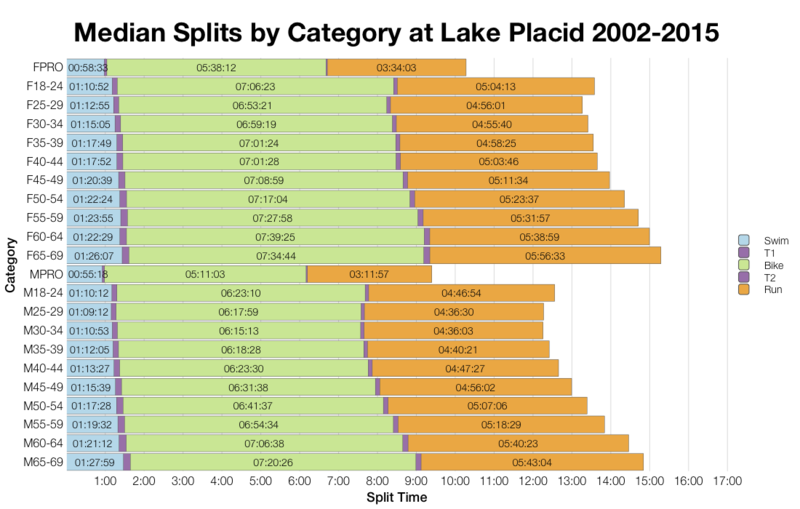 Based on the athlete list I’ve calculated the slot allocation for Lake Placid and the automatic qualifying times from the results. Exact start numbers and roll downs will likely affect some of these times. 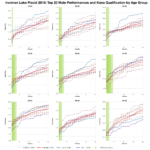 For comparison with previous years and other races check my Kona Qualification page. 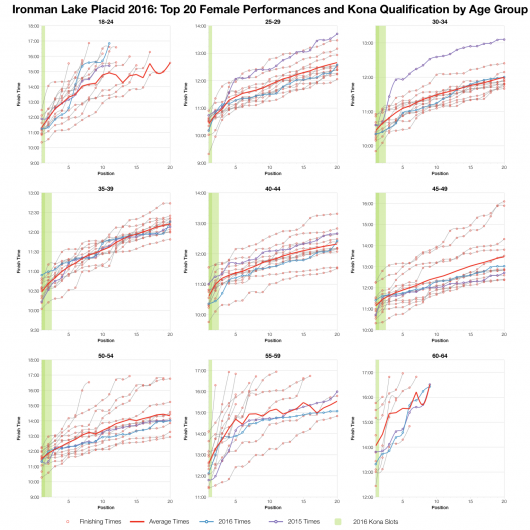 There’s no consistent pattern to the top twenty results in each age group – some came out slower this year, others faster. This was certainly not the slowest year for qualifying on the course, nor was it the fastest. 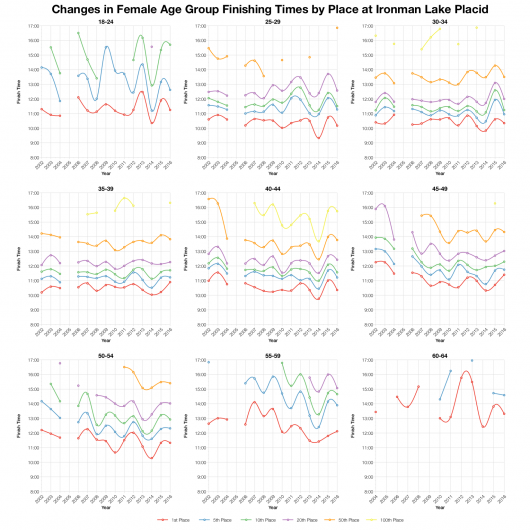 The results fall within the range we’ve seen at Lake Placid, although not consistently enough to imply a trend. 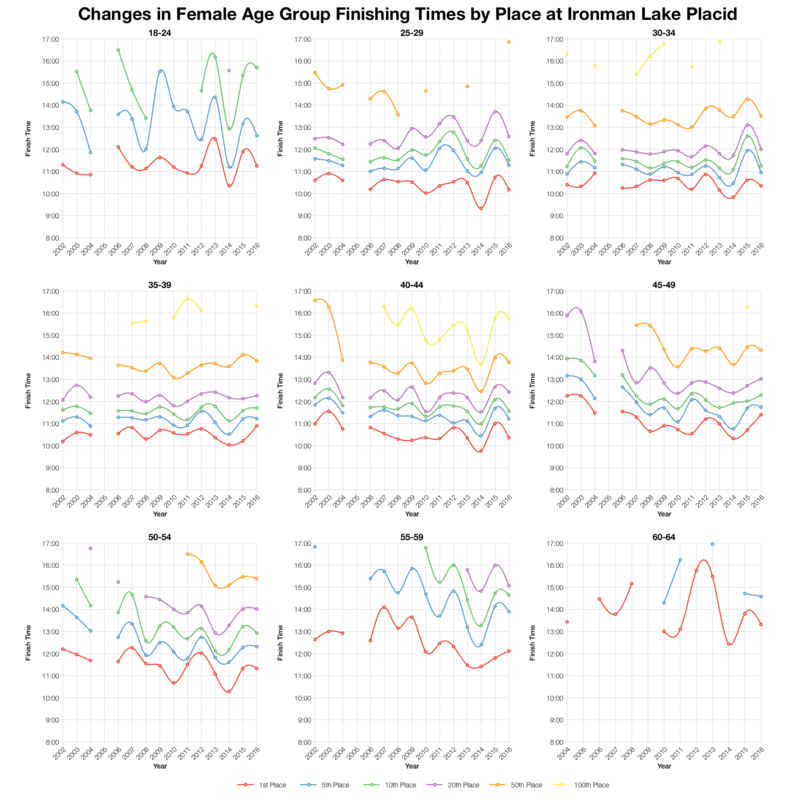 My feel is that the front of pack athletes were largely on par with previous years, but as we’ve seen in other races the growing number of competitors is expanding the middle to back of pack and pulling down averages. 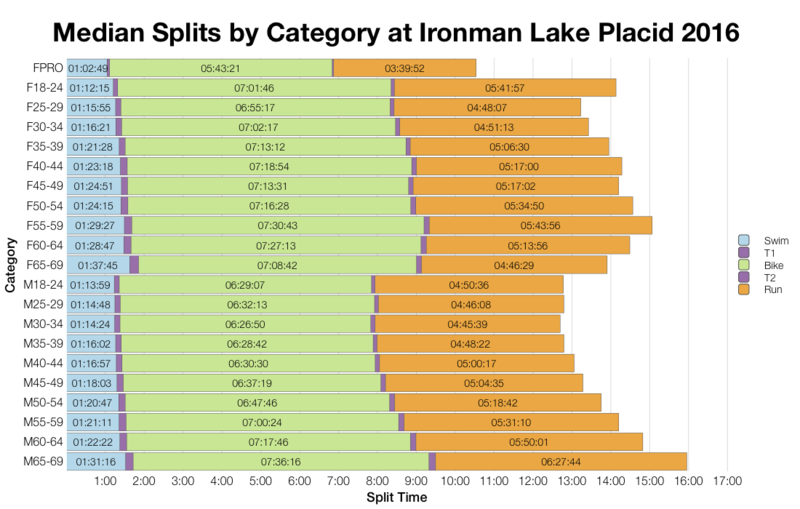 You can access a spreadsheet of the full results and splits from Ironman Lake Placid 2016 on my Google Drive.